There is much to be plumbed from blistering necropsy of race that is American Moor at the Anacostia Playhouse. 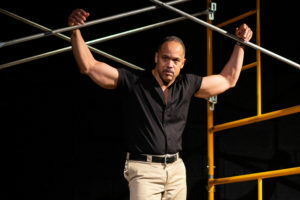 The one-man show written and performed by Keith Hamilton Cobb is a unique and thought-provoking experience of contemporary theater, and the seemingly innocuous structures and codes behind which racism can be innocently costumed. The scaffolding is an audition: Seasoned black actor Cobb is vying for the title role of Shakespeare’s Othello before a young white director (voiced offstage by Josh Tyson) intent on instructing him on how to play the Moor. Cobb struggles against tone-deaf directorial regurgitation of a one-dimensional tragic figure, seeking to infuse the doomed general’s character with lessons learned from a lifetime of the black experience: pain, vulnerability, resignation, resilience, sensitivity, and savvy. Even as he rails against it, Cobb knows that the white stage establishment isn’t interested in the discomfort of his words. 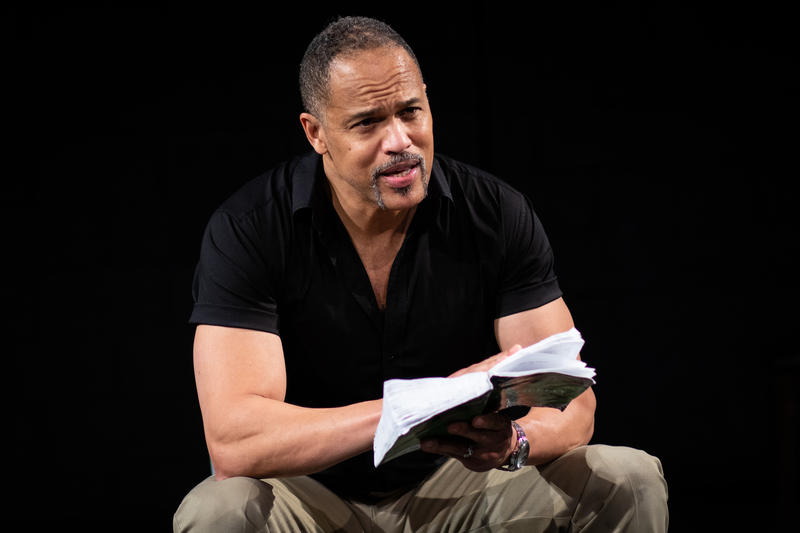 His provocative soliloquy blends a performer’s love for the genius of Shakespeare and the complexity of Othello with the debate over color-blind casting and a larger reflection of race and bias in America. The set is simple, a stripped down stage with scattered theater effects. 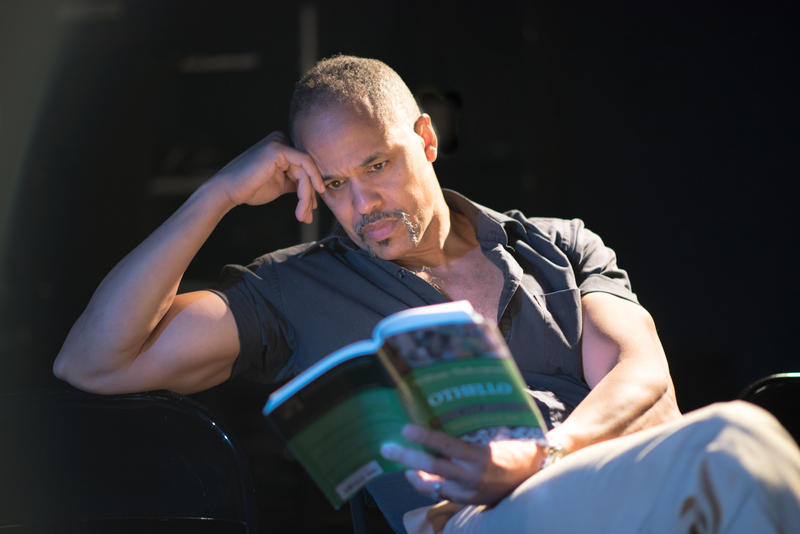 The only props are a well-worn Othello script and Cobb’s magnificent biceps (at times a distraction in their perfection). The speakeasy lighting and close, black-box quarters foster an intimate audience experience. Directed with raw honesty by Kim Weild, Cobb carves open his soul, one minute prowling, the next pleading, eyes alternately drilling through you, begging comprehension, and welling in pain. Cobb adroitly extrapolates his experience of not being truly seen as an actor to the larger frustration, torment, and fury of Black-Americans at being unseen, or not seen justly. To put a point on it, the modern Othello experience. American Moor is an original and searing piece of theater. It probes sacred idols of the trade, establishment complacency, and the losses we all suffer from artistic boundaries. Any theater connoisseur will profit from the conversation. American Moor runs through February 3, 2019 at the Anacostia Playhouse, 2020 Shannon Place SE, Washington, DC 20020 (202-290-2328). Run time is approximately ninety minutes, with no intermission. For more information, or to purchase tickets, click here. What’s Up With Those Sculptures Popping Up in Foggy Bottom? !